Better Than The Book's 2nd full-length album Hopes and Dreams is COMPLETE and early access has opened on Patreon, some more updates + see you in 2 weeks! Hi everyone and I hope you've all been having a splendid week! As always it's been another busy one here at JabunAudio preparing for this latest Better Than The Book album release and wrapping things up before the 11 day downtime over the Easter period. Exciting times it has been though and I'm happy to confirm that as of Saturday, the JabunAudio website has been renewed for another year of services and portfolio archives. Horray! I also had the pleasure this week of sending out JabunRecords' first royalty cheque which was an exciting milestone for me. Onto the main event for this post though, I have some HUGE news for you today so let's get straight into it! After much hard work and preparation, I am ecstatic to announce that Better Than The Book's 2nd full-length studio album “Hopes and Dreams” is finally complete and ready to share with the world! The lead single is due to be released on May 10th, along with an album art reveal and pre-orders opening on Bandcamp, and after another 2 singles over the next few months, the full album will be released to the public in July! Exciting times! If you can’t wait to hear it all though, early access has now opened to my supporters on Patreon, and with this month’s rewards posted out last weekend, it’s really never been a better time to join the pre-release party than now! If you're a $5+ tier patron, then you'll be receiving the full 10 track (39 minutes) Hopes and Dreams album, Mp3s, WAVs and artwork a whopping 90+ days before it's released in full to the public in July (such is the promo schedule)! For the $1+ patrons you'll be receiving the full sized cover artwork for the album before the public reveal with the lead single in a month's time, as well as the singles and album as they are released to the public over the next few months. With so much going on, it's never been a better time to join Better Than The Book and my other projects on Patreon and remember that when you sign up, you'll receive all the previous rewards for your tier including the entire rest of the Better Than The Book discography with Patreon exclusive bonus tracks, demos and much more. Sign up for as little as $1 a month, or $5 to pick up the new Hopes and Dreams album now (as well as the entire BTTB back catalogue) before it's released to the public. I hope you enjoy it! That about wraps things up for this post! After such a busy time since the start of the year and before, I'm looking forward to the extended break next week, but after that I'm sure it'll be back to hard work on the album promotion before the lead single is launched on May 10th! Big things to come when I get back but I hope you have a great time until the next post and as always thanks for supporting JabunAudio, Better Than The Book and my various music projects. Take care and see you in 2 weeks! Better Than The Book - Hopes and Dreams album finished + some more updates! Hello everyone and hope you're having a great week so far! As always it's been a busy time over here, this time finishing off the upcoming Better Than The Book - Hopes and Dreams album and sorting out the various extra things for its release. It'll only be a short blog post this week with some updates on how things are going, so let's get straight to it! So first of all, I'm super happy to announce that the Better Than The Book - Hopes and Dreams album is now official finished as a product! Artwork is done, master audio WAVs have been exported and checked to perfection, and the mp3s have been converted and tagged with all the metadata! ISRCs and UPCs have been secured and are in the process of registration at the moment, and the album is in the process of being uploaded to distributors too. I've also been working closely with the PR people and we've selected the 3 singles for the album and sorted a rough release date / schedule too (to be set in stone when the first single is released in May). Photo shoots have been booked and some extra stuff is in the process of being sorted too! All in all super busy but super exciting times! Since the album is finished now I'll be uploading it to Patreon within the week as a reward for the $5+ Early Pigeons and patrons, so if you want to be the first to hear it even before it's officially announced with the lead single, now would be a great time to sign up to Patreon for the $5 of higher tiers, and you can pick up the rest of the BTTB discography and more when you do. I hope to see you there! As well as those exciting updates on the album, I've also been busy this week with the usual yearly admin for JabunAudio. Tax returns have been completed (and much better results than last year which is nice), and the JabunAudio website domain has been renewed for another year (the website service itself will be renewed this coming Saturday). All in all a very productive week, though I'm looking forward to getting back to making music when all the admin work is done, as well as a break when I go away in a week's time. And that about wraps things up for this post! I'll be busy over the next 7 days before I go away finishing off as much as possible for the album release (and much more), and next week will be the final blog post until I return at the start of May. Until then I hope you have a great time whatever you're up to and thanks as always for supporting JabunAudio, Better Than The Book and my various projects. See you next week and take care! Introducing the JabunAudio Music Production Article Archive, scheduled downtime, some updates and reminders + setting and reflecting on some goals! Hi everyone and hope you're having a great start to April (and weren't caught out by too many April Fools' pranks)! It's been a busy week for me cutting the final master exports for the upcoming Better Than The Book - Hopes and Dreams album and finishing off the cover artwork, as well as helping sort out some more super exciting things for the release, along with the less exciting admin side of things too! A quick reminder that there aren't any new Patreon rewards going out this week, but more great stuff will be coming very soon when the album is complete and that any new patrons will still gain access to all the previous rewards for their tiers when they sign up too (www.patreon.com/NickStanding). In the mean time, I still have some exciting news to share with you at the beginning of this month, so let's get straight to it! Firstly this week, it's the beginning of the month which means I've just sent out another JabunAudio music production newsletter. There's no new topic to discuss this time, but instead I have a special announcement for you! As many of you already know, over the past year I've been sending out this monthly music production article to those who have signed up on the JabunAudio homepage and the series so far has covered many topics ranging from mastering, my favourite genres of pop-punk and ska-punk, to many more tips and discussions which can be applied to almost any genre of music. In this final newsletter (for now at least), I'm proud to introduce the JabunAudio Music Production Article Archives, a collection of all the articles from this series in an exclusive hidden section of this website. You can sign up for free on the JabunAudio homepage to get all the access and I hope you enjoy reading them if you haven't already. For those of you who've been keeping up with it over the past year (or if you've just signed up and read through), which was your favorite article? I hope to get back to the series at some point in the future, but for now I'll be taking a bit of a break to concentrate on other things and gather more ideas. Thanks for all the support! Next this week, a heads up for some seasonal downtime. JabunAudio will be closed for the Easter break from Thursday 18th April to Monday 29th April, during which I will be unable to carry out any audio work. Any communications during this period may also receive delayed responses, though feel free to message me and I'll get to any messages by Monday 29th April. Apologies in advance for any inconvenience, and I look forward to working with you when I get back! Of course the blog post will be on hiatus during that period too meaning the last blog post before the break will be on Thursday 18th April before a 1 week break and returning on Thursday 2nd May! Hope you don't miss me too much and I look forward to sharing more music with you all when I get back! April is always a busy month with the start of the new tax year, my birthday and (most years) Easter as well, so it's looking to be a busy one as usual. The first 2 goals should be fairly easy admin tasks to complete, and similarly 4) should be easy to sort out too. 3) will be the most difficult as on top of the album being finished audio+art-wise, there's also the mp3s to convert and tag, some other exciting stuff to finish though I'll keep that a secret for the moment, a press photo shoot to organise and edit, pre-orders to set up, ISRC + UPC registrations to make, and much liaising with PR people to do; it's going to be super busy, especially since I'm not here for much of the month! The aim is to be all prepared to release the album to the early pigeons ($5+ tier) on Patreon before I head off, then have all the preparations made ready to release the lead single and launch pre-orders in May. We'll see how it all goes! That about wraps things up for this week! No doubt this coming week for me is going to be filled with admin work and finishing off the album as a product, but we'll see where else the wind takes me. Until next time, I hope you have a great week and thanks as always for supporting Better Than The Book, JabunAudio and my various projects! Take care and see you in the next post! Hello everyone and hope you've had a great week so far. With the upcoming Better Than The Book - Hopes and Dreams album audio pretty much finished, I've been working intensely this week on the album's cover artwork which is coming on well but taking a bit longer than I predicted. Still, it was over a year working on the songs and audio for the album, so spending a bit more time on the artwork seems justified at this point. No point rushing these last few hurdles, and I positive the wait will be worth it! Onto other news this week, there's just a few little things to share, so let's get to it! First of all, Fun Station 4 Kids has released another Dinosaur animation right on time for March: Dinosaur March! While I wasn't directly involved with the production of this one, it features my track "See Ya Later" as the credits music and it was great to see all the dinos being drawn behind the scenes too. With a whopping 33,000 views in the first 36 hours since release, it's been the quickest start in views to any of the FS4Ks projects to date! Simple but effective! Check out the video below and what's you're favorite dinosaur in the video? Mine is Moschops. He so chonky! Enjoy! That about wraps up this shortish post! I'll be continuing to work on the album art until it's done, then it'll be time to finish preparing the album as a finished product ready for the tonne of admin work surrounding its release! It's going to be a busy time for sure, but we'll see if there's more exciting news to share in the next post. Until then, thanks as always for supporting JabunAudio and my various projects and I hope you have a great week whatever you're up to. Enjoy the dinosaurs and take care! First full-album master test for Better Than The Book - Hopes and Dreams complete and sent out for feedback! Hi everyone and hope you're having a great week! Just one thing to report for this blog post so it's going to be a short one, but that one thing is that the first full-album master test for the upcoming Better Than The Book - Hopes and Dreams album is finally complete and has been sent out for feedback! Unless any problems are brought to my attention to address, the album is pretty much complete audio-wise, which means it's time to get back to some artwork. Exciting times! And that's it for this blog post! Short, sweet but good news I think. Looks like I have some client mastering work to get on with this coming week too so along with working on the BTTB album art, it looks to be another busy one. Until next time, thanks as always for supporting Better Than The Book, JabunAudio and my various projects and I hope you have a great time whatever you're up to in the coming week. Take care and see you in the next one! Ballet of Pain receives Front Page award on Newgrounds, Patreon rewards and the final JabunAudio email article sent out, BTTB Hopes and Dreams ready for mastering + setting & reflecting on some goals! Hi everyone and I hope you've been having a great week and had a good helping of pancakes on Tuesday if you celebrated it! It's been another intense week here at JabunAudio mainly continuing with work on the upcoming Better Than The Book - Hopes and Dreams album, which is going very well (more on that in a moment). For the first time in a few months, there's no video to share from World Beyond this week, though I'm sure there are at least 3 left to go by my count. In any case there's still lots of news to cover so let's get started! Firstly this week, a celebration as last week's game "Ballet of Pain" by Alex Clay received a front page feature on Newgrounds.com! A huge congratulations, and overall the game's reception has been successful so far. If you've yet to check it out, then you can play Ballet of Pain over on Alex's Webpage by clicking the picture below. We hope you enjoy the bittersweet adventure! Next this week, some of the usual beginning of the month news to share! Yesterday was the first Wednesday of March which means I've just sent out rewards to the $1 /$2+ patrons, and this time I'm sharing another batch of Patreon exclusive downloads: a handful of demos from late 2011 / early 2012 for Better Than The Book songs before Better Than The Book was even a thing, which would later become tracks on the 2016 Two Year On album! If that sounds good to you, then become a patron for as little as $1 a month to download this music and all previous rewards for your tier including the entire current BTTB discography! For those of you who decide to join (or have already joined) the $10 tiers or higher, this month I'll be sharing some work in progress draft artwork for the upcoming Hopes and Dreams album as well as a demo master for track 06 Get A Haircut! Enjoy the exclusive sneak peek! Continuing with the beginning of the month news, I've just sent out another JabunAudio music production email article as well, and this one will be the 10th and final one in the series (for now at least). This time I'll be discussing my favourite methods for making a chorus (or equivalent section) sound bigger and hit harder to really make an impact whenever this important section of your song comes around! I'll be focussing on more traditional band arrangements, but many of these methods can be applied to various styles of music. If that sounds interesting to you, sign up for free on the JabunAudio home page, I hope you enjoy it, and be sure to share with anyone you think would be interested! There'll still be one final email with a special announcement next month before I go on hiatus, but until then, let's make the most of more discussion! ​Next this week, some quick updates for the upcoming Hopes and Dreams album: as it currently stands, all the mixes have now been tweaked for maximum impact and the entire album is sequenced, trimmed and glowing with a lovely layer of mastering polish pretty much done! I just need to go through to check for errors and make any final tweaks if need be, then it'll ready to send off to some fresh ears for feedback! It's very VERY nearly there in terms of the audio and I'm aiming to certainly have it sent out before the next blog post, before I get back to working on the artwork while I wait for some feedback! Exciting times! 3) Set aside ISRCs for the new Hopes and Dreams album and fill in all the information I can in my records (apart from the stuff I'll need to sort just before and after the release). Looks like number 1) is almost but not quite done, but considering the busy and short month of February I don't think I'm unreasonably behind schedule for this one (a week or two at the most), and should have it done within a week for sure. 2) Is sort of done too, though I'd have liked to get an even better draft completed, or even started on the actual artwork. Still, the goal was technically completed, and the $10 tier on Patreon certainly has something to show for it. 3) was completed at the very beginning of the month so a big tick in the box to put there! Overall, I feel like I'm a little behind this month, but not too far. Let's set some new goals for March! Only two goals to set this month, but lofty goals they are! Essentially I want to have the content of album completed by the end of March / beginning of April, which I think is just about doable unless there are any major complications. I also have some other background and personal goals, some of which have already been completed pertaining to the JabunAudio Music Production Article, but all will be revealed next month. These two goal above are the big ones and the focus for the next 4 weeks! Any goals you'd like to share? Comment below and we can keep each other accountable! And that about wraps things up for this week! I'll be busy doing the error checks and final tweaks for the Hopes and Dreams BTTB album over then next week, but other than that, I'll have to see what comes my way! Until next time, I hope you have a great week whatever you're up to and thanks as always for supporting JabunAudio, Better Than The Book and my various projects, whether here or on Patreon (or both!). Take care, and see you in the next post! Jabun featured in Ballet of Pain game by Alex Clay, another track "Revolt" from World Beyond to share, the February $5+ Patreon rewards have been sent out, another instrument acquired (melodica) + some more updates! Hello everyone and I hope you've been having a great week since the last post! I was away last weekend, but apart from that I've been busy working on the final mix tweaks for the upcoming Better Than The Book - Hopes and Dreams album (more on that later) as well as working on the various projects and updates I'll be sharing with you today! It's going to be a longer post this time, so let's get straight into it! Next this week I have another video from World Beyond to share with you, and this time it's "Revolt" which is the only track on the recent album which has any lyrical vocals on it (and some fine vocals they are)! I'm on bass and lead guitar again for this one, and I hope you enjoy the epic visualiser for this latest track! I have a feeling I know what's coming next, and if that's the case I'm super excited for the next video! It's going to be epic! You can check out the rest of the Nobody Asked For this So I Did It album on World Beyond's Bandcamp page, and be sure to subscribe to the World Beyond YouTube channel to see the videos as the come out! Enjoy! Next this week, yesterday was the final Wednesday of the month which means I've just sent out rewards to the Early Pigeons and $5+ patrons on Patreon! This time I'm sharing another batch of Patreon exclusive downloads: a handful of demos from late 2011 / early 2012 for Better Than The Book songs before Better Than The Book was even a thing, which would later become tracks on the 2016 Two Year On album! If that sounds all good to you then become a $5+ patron to access these demos and the rest of the Better Than The Book discography (including the One Small Step EP, Two Years On album and more) instantly! This latest set of rewards will also be sent out to the $2 Hi-Fi Pigeons (everything) and $1 Pigeons (Mp3s and Artwork only) next week on Wednesday 6th March, and if you aren't already a patron, remember that you'll also get instant access to all the previous downloads for your tier too when you sign up. For those of you who decide to join (or have already joined) the $10 DEMOlition Pigeon tier or higher, this month I'll be sharing some work in progress draft artwork for the upcoming Hopes and Dreams album as well as a demo master for track 06 Get A Haircut! Enjoy the exclusive sneak peek! Exciting times! Another bit of super exciting news this week, I've added yet another instrument to my arsenal: a melodica! For those of you who don't know, the melodica is a free reed instrument like a harmonica and is essentially a reed organ played with (in my case) piano style keys and powered by the user's breath. You can play it with a hose-like mouthpiece for playing with two hands, or with a short mouthpiece for playing with one hand while holding with the other in a trumpet or clarinet type position. There are a number of different kinds of melodica's and mine is a fairly basic 32 note alto (I think) model, but I've been meaning to get one for some time and it has not disappointed my expectations; I love it! The breathe control makes it an incredibly expressive instrument despite its almost toy-like appearance and unlike other traditional woodwind instruments, it is fully polyphonic. The tone is somewhat like a more mellow harmonica, less chorusy accordion, covering a tonal pallet similar to a clarinet when played softly to a less bright trumpet when blowing hard. Tuning it was quite the adventure too as I've never tuned a free reed instrument before, but it's sounding better than ever after some TLC on the reeds. I'm certainly looking forward to putting it to good use in my future music work, so be on the lookout for it in the next Jabun and Better Than The Book albums (as well as my client composition work)! Fun times! Finally for this post, let's conclude with some updates on the upcoming Better Than The Book - Hopes and Dreams album. I didn't have quite as much time as I expected this week to work on it, but as it currently stands, 8/10 tracks have been tweaked to perfection (by my ears anyway), with the 9th almost done too. Once those 2 final tracks are done, it'll be time for the final mastering tweaks, then I'll be sending it off to some fresh ears for feedback, while I freshen my own ears and take a little break to work on the album art. It's almost there, but there's still some more work to do! And that about wraps things up for this week! It's the start of the month which means some admin work for me to do over the following week, but between all that I aim to have those final 2 BTTB tracks done before next weekend! Other than that, we'll see where the wind takes me, and until next time I hope you have a great week whatever you're up to and thanks as always thanks for supporting JabunAudio and my various music projects. See you in the next one, and take care! Tales of Zale Episode 1 hits 100k views on YouTube, another track to share from World Beyond + some more BTTB updates! Hi everyone and hope you're having a great week so far. It's been another busy one here at JabunAudio mainly working on the final mix tweaks on the upcoming Better Than The Book - Hopes and Dreams album, but before we get into that, there's some big celebrations and more videos to share so let's get straight into it! Check out the celebrated 6 figure video below, and if you enjoy it, go watch the rest of the Tales of Zale series (most of which I'm heavily involved in) on Sif's YouTube channel. Episode 3 I'm told is in the works so be on the lookout for that in the hopefully not to distant future. Next this week I have another track / visualiser to share from the recent World Beyond "Nobody Asked For This So I Did It" album, and this time it's the motivational alternative metal track "Because We Can"! Once again I'm on lead guitar and bass for this one, and I hope you enjoy the visualiser music video that Vlad put together. Not many of these left I think, but I'm looking forward to the grand finale soon! Be sure to subscribe to the World Beyond YouTube channel to be first to see it, and enjoy "Because We Can" below! Finally this week, just another couple of updates on the Better Than The Book - Hopes and Dreams album. As I mentioned before, it's been a busy week going through and doing the final polishing for the mixes prior to mastering, and as of yesterday 6/10 mixes are sitting in the mastering session waiting to be trimmed and exported with a final layer of polish! I'm just about on schedule to finish the final mixing tweaks by the end of the month, though due to the various trips away, I think I'm about a week behind where I'd currently like to me. I'll be working hard to get back on track, and aim to have all the mixes done by the next blog post, ready for mastering in the first week of March. Sounds just about doable, but I'll take the time needed to get it sounding the best it can be. More updates as and when I have them, but it's nearly there! And that about wraps things up for this week. I'll actually be away again for some of next week, but I'll be working on finishing up these BTTB mixes in all the time I have available in the studio! I'm sure there'll be more stuff to share in the next blog post, and until then, thanks as always for supporting JabunAudio, and my various projects, and I hope you have a great weekend and beyond whatever you're up to. See you in the next one, and take care! 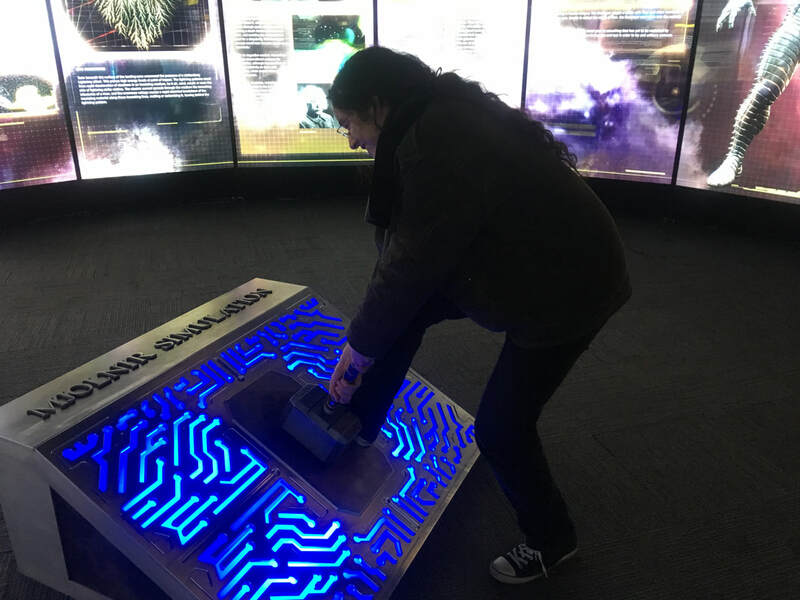 A trip to Marvel Avengers S.T.A.T.I.O.N. (and more tales of exciting weekends), another track to share from World Beyond + some BTTB updates! Hello everyone and hope you've all had a great week since the last blog post. I have pretty much not been here for most of it (Friday to Tuesday evening), so there's not a whole lot to report about in terms of my work, but there is some new music to share and a few little updates which we'll get onto in a moment. First though, I thought it'd be cool once again to share with you what I was up to this past weekend, and even without seeing Ozzy Osbourne (get well soon sir), boy was it a busy one! Let's get started! Saturday commenced with the traditional family coffee morning which was as usual a great start to the weekend, before myself, twin Eamon and girlfriend Eva headed to London for a late Christmas present: a trip to the Marvel Avengers S.T.A.T.I.O.N. exhibition/experience! Unfortunately for us, it was rail replacement bus services all this weekend, which meant a much longer journey than usual and so no time to explore London (and Denmark Street) before going to the exhibit, and even at our speediest we arrived at 3:20 pm for what should have been a 3:00 - 3:30 pm entry. Cutting the time a little short there! The exhibition was simply fantastic though if you're a fan of the Marvel Cinematic Universe! With props all the way back to the Iron Man suit that Robert Downey Jr wore back in 2008 (the chunky one in the cave), to Captain America's WWII uniform and shield, to even scale models of how HUGE the Hulk's hands are, as well as tonnes of articles about the science (both factual and only slightly fantasy) behind many of the characters and event during the franchise, it was a fantastic display and step into the world of the Avengers! 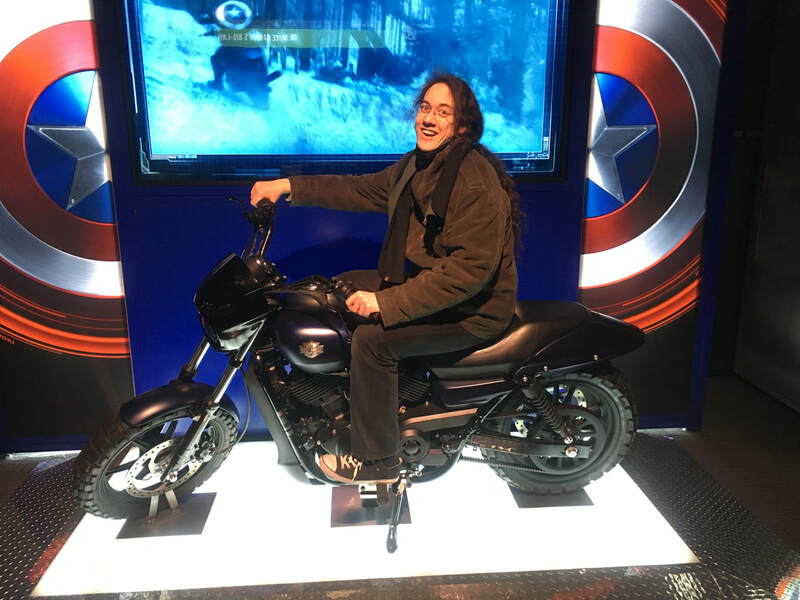 I shan't give too much away here in case you go and see it for yourself but here's some pictures of me pulling a silly face on Captain America's Harley Davidson, and trying to pick up a replica of Thor's Hammer Mjölnir! There were also many interactive experiences including a motion tracked Hulkbuster Armour game, and a strength test in which somehow I managed to consistently register as just about stronger than Natasha Romanov (AKA Black Widow), which I'm pretty chuffed about considering I'd describe my build as "a bunch or twigs held together by string", and neither Eamon nor Eva could figure out how I managed it. Perhaps all those years of playing doubleneck? We shall never know... Thanks so much to Eva for the fantastic day out once again (and for taking the pictures too), and I wonder what our next adventure will be! Sunday was another day out too, again rushed because of the lack of trains, so not much time to explore Brighton this trip either. The trip's main purpose though was to see the new Battle Angel: Alita live action film, based off the 90's manga/anime of the same name, and overall, fantastic execution, especially the visuals, acting and story. I won't spoil anything here, but the one thing I would say is DUDE BBFC, you really messed up with the age rating on this... 12A?! More like 15 (even the animated version was a 15). Children should not be watching this level or gore and dystopia even if accompanied by a parent, I have no idea what you were thinking with that... Very well done film though. I'd highly recommend to any fan of the franchise! Finally for the long weekend, Monday (with the Ozzy gig being postponed) was spent chilling and catching up with friends instead which was great. Tuesday morning was exciting too as my brother won an auction last month for some props used in another live action 90's anime adaptation, 2017's Ghost In The Shell film, and the items finally arrived in the post which was super cool. After that, it was a long day of travelling back to reality which included a headphones synth jam on the train. Overall another great action packed weekend! ​Onto the audio news for this week, I've another great track to share with you from last years World Beyond album, a groovy heavy metal tune "Nickel and Dime"! I'm on bass and lead guitar as usual for this one, and I hope you enjoy the vizualiser music video that Vlad put together for it. More music to come soon, and if you can't wait, be sure to check out the full "Nobody Asked For This So I Did It" album on Bandcamp via the link below. Enjoy! Lastly for this blog post, a couple of updates on how the upcoming Better Than The Book - Hopes and Dreams album is coming along! Although I haven't had much time to work on it this week, as of yesterday 2/10 mixes have been tweaked to perfection (to my ears at least) and have been exported ready for mastering when they're all done. The mastering session has been set up too with a solid processing chain set up ready for the final tweaks and polishing when the mixes are done. It's slowly but surely coming along, and hopefully I should be at least halfway through the album by the next blog post (if all goes well). The finish line (audio-wise at least) is well within sight, and I'll keep you updated with the progress as and when there are things to report! That about wraps things up for this post. Apart from working on the upcoming Better Than The Book album, I have a couple of other things to take care of this week which'll hopefully make an appearance in the next blog post. We'll see how it all goes and I'm sure there'll be another World Beyond visualiser to share too! Until then, I hope you have a great and productive week and thanks as always for supporting JabunAudio and my various music projects. Have a good one and take care!